This tribute album was neither authorized nor endorsed by the members of Iron Maiden or their management. It was, however, put together purely out of respect for and homage to the band and their music. Track A1: rare track, from Killers album, recorded at Trax East Studios, South River, NJ. Track A2: rare track, from The Number Of The Beast album, recorded at Wireworld Studio, Nashville, July 1999. Sebastian Bach appears courtesy of Atlantic. Track A3: exclusive track, from Iron Maiden album, recorded at Festival Studios, Kenner, LA. Track A4: exclusive track, from Killers album, 8 track digital recording. 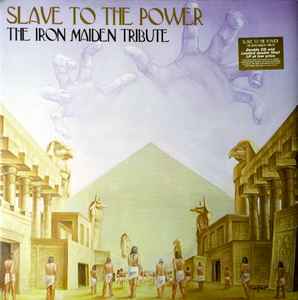 Track A5: exclusive track, from Powerslave. Track B1: rare track, from Piece Of Mind album, recorded and mixed at Above the C Studios, Tampa, FL. Additional mixing at Excess Studios, Rotterdam, Holland. Track B2: exclusive track, from Piece Of Mind album, recorded at DBT Music Studios New York, June 1999. Track B3: exclusive track, from Powerslave album, recorded 1999 at Home Brew Studio, Wayne NJ. Track B4: rare track, from Killers album, recorded and mixed at the Saltmine, Mesa, AZ 1999. Track B5: exclusive track, from Seventh Son Of A Seventh Son album, recorded at Baby Studios. Track B6: rare track, from Somewhere In Time album, recorded at Studio 301, Los Angeles, CA. Track C1: rare track, from Iron Maiden album. Recorded, mixed and mastered at Powerhouse, Hamburg, 1999. Track C2: exclusive track, from Somewhere In Time album, recorded at Studio 301, Los Angeles, CA. Track C3: rare track, from Killers album, recorded at Crumb Studios, Granada Hills, CA 1999. Ray Alder appears courtesy of Metal Blade Records. Track C4: exclusive track, from Somewhere In Time album. Recorded at Orbital Studio, Sao Paulo, Brazil. Mixed at Midas Studio. Fates Prophecy appears courtesy of Megahard Records. Track C5: exclusive track, from Killers album, recorded May 2000 in Das Boot Studios, Stockholm. Track D1: exclusive track, from The Number Of The Beast album, recorded at Hai Tex Studios in Dallas, TX 1999. Track D2: exclusive track, from Piece Of Mind album, recorded at Brno Studios, Malmoe, Sweden. Track D3: exclusive track, from Seventh Son Of A Seventh Son album. Recorded at Academy Studios. Solstice (2) appears courtesy of Necropolis Records & Cthulhu Himself ! Track D4: rare track, from The Number Of The Beast album, recorded at Ultimate Music, Cortland, NY. Track D5: vinyl exclusive bonus track, from Killers album, recorded & mixed at Malarea 51.